Shocking, I know. An archaeological excavation held during the British summertime with consistently good weather!? Thus far, Archaeology Live! 2014 has seen a lot of sunshine and an equal amount of exciting discoveries! 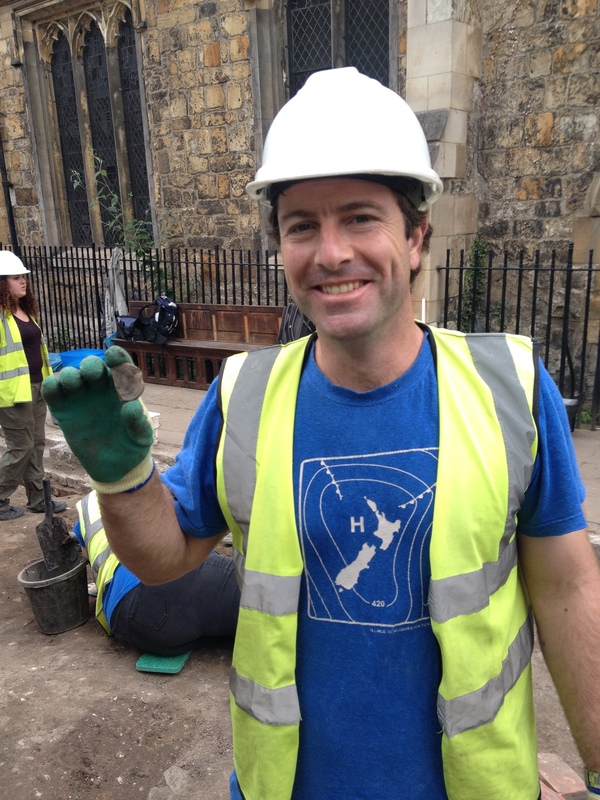 Week 2 of the All Saints excavation welcomed some new members to the team. This mix of Archaeology Live! veterans and fresh faces quickly joined those carrying on from week 1 as work resumed in the trench. 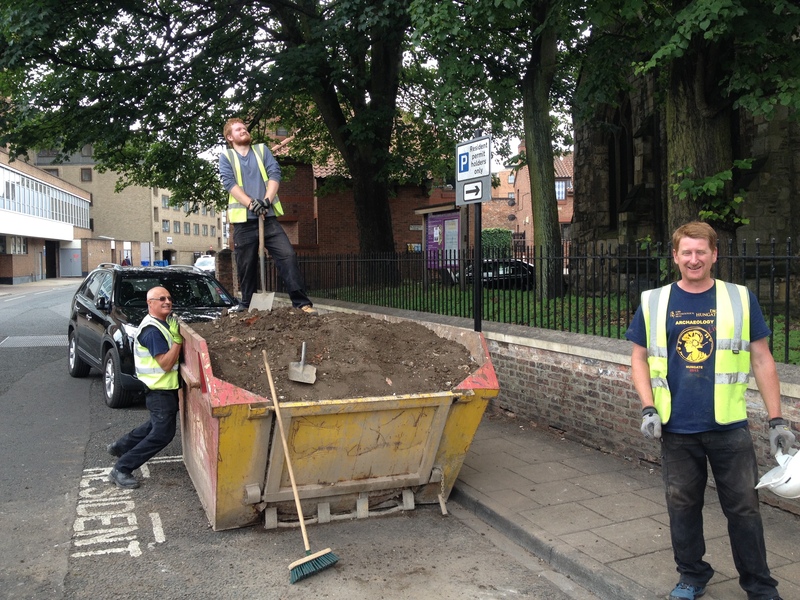 Toby’s team, working in ‘This End’ carried on with the challenging task of picking apart the much altered drain network below the south-west end of the former boxing club. Cleaning and recording features like these can involve squeezing into some tight spaces, not that returnees Bri and Matt were deterred! Working with Archaeology Live! placement Gus, they recorded the various phases of the drainage system and began to lift the ceramic pipes and record their cuts. 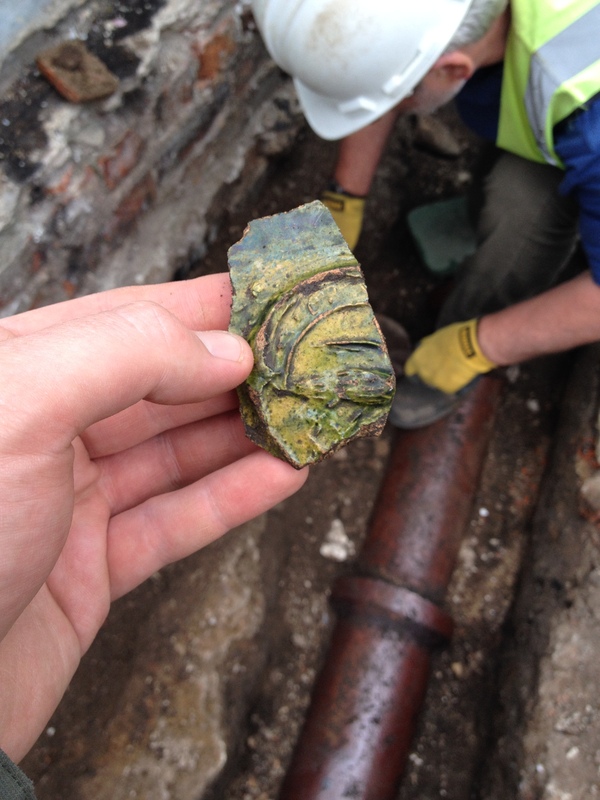 The sections of these pipe cuts provide a sneak preview of the medieval archaeology that we will be looking at in the coming weeks, with a series of refuse pits becoming clearly visible. Archaeology Live! legend Bri hard at work. Removal of a ceramic U-bend (pictured above) allowed us to see a clearer view of the wall sequence at this end of the building. It seems numerous separate walls have been incorporated into the boxing club. The earliest appearing to have a footing of large limestone blocks, possibly relating to the church. A challenge in the coming weeks will be to remove several layers of render to help make sense of this construction sequence. Various elements of walling becoming visible behind the ceramic drains. Scott and Barry, another pair of returning archaeologists, were working close by on the footings of the boxing club walls. In this area, the construction cuts were masked by later dumps of rubble and cement that had to be recorded and removed before the wall footings could be exposed. Once reached, the construction backfills rewarded Scott and Barry’s hard work with some lovely artefacts. Scott was very pleased with his first copper alloy coin. Once this is examined and cleaned up by our conservation department, this find may prove useful in tightening up the dating of this wall sequence. Scott and his freshly unearthed coin. 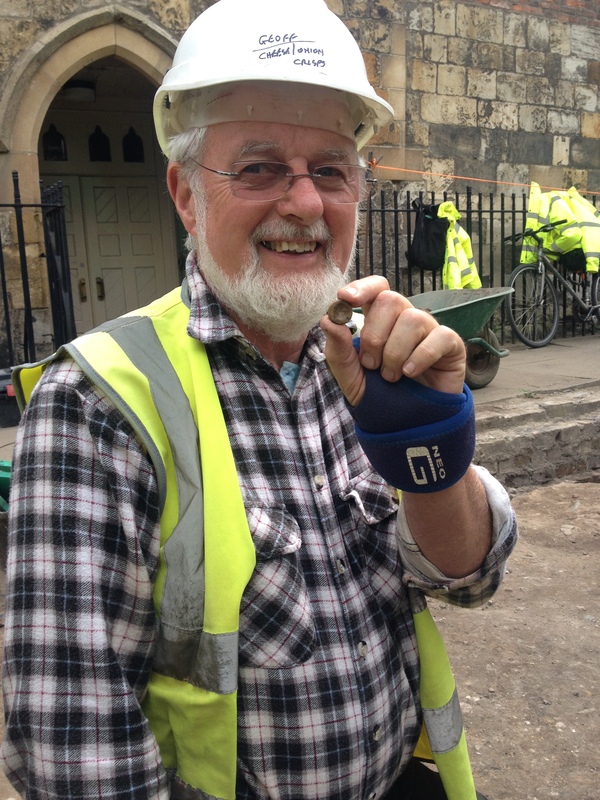 Barry made an exciting discovery of his own as he found a fragment of a decorative seal from a medieval vessel. These circular decorative features appeared on many green-glazed jugs and pots, some of which could be quite elaborate! The imagery can relate to family groups and trade guilds. Barry and his possible guild seal. A closer inspection of this particular example reveals an image of a bird, with parts of the body and wings remaining visible. Further research may allow us to relate this to a particular group or family. A closer look at Barry’s medieval seal. Elsewhere in ‘This End’, Lauren and Ben were also working to free up wall construction events. 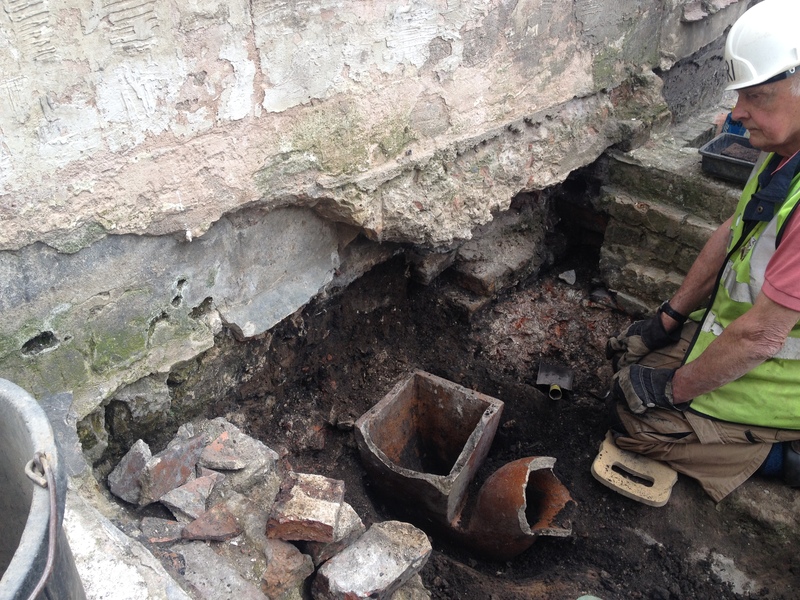 Removing these deposits relating to the boxing club’s construction have revealed more of an 18th century brick floor. It looks increasingly possible that this floor relates to nearby structural elements that were discovered in week one (http://archaeologylive.wordpress.com/2014/06/29/archaeology-live-summer-2014-week-1/). Recording wall construction events in ‘This End’. The brick floor is visible under the hand shovel. 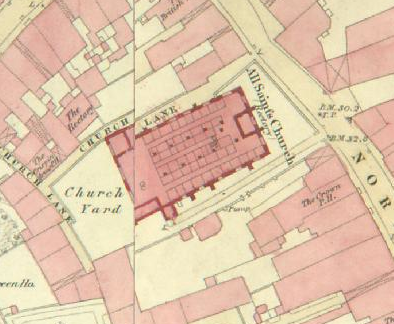 The 1852 OS map of York shows a building to the north-west of the church marked as ‘The Rectory’. It is likely that the brick floor relates to this structure. 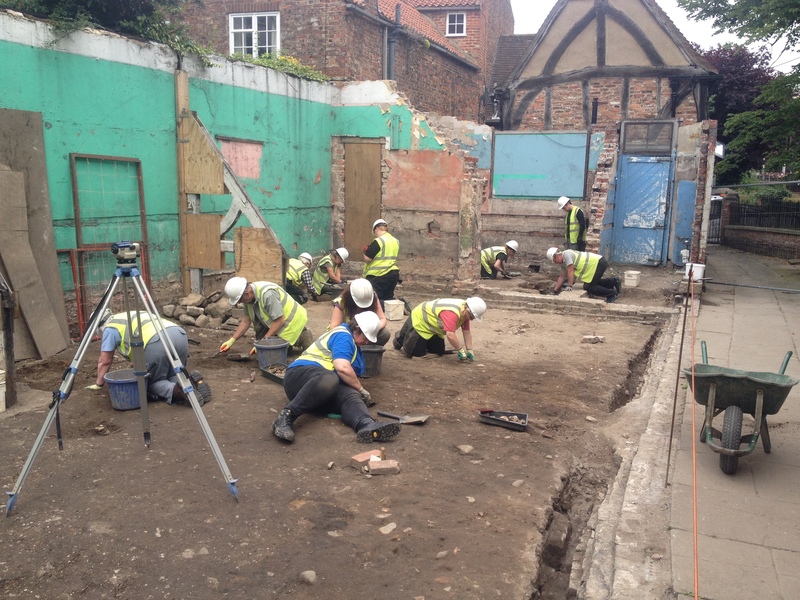 The boxing club construction has destroyed much of the Rectory building, but as work continues in this area we hope to learn more about the post-medieval building sequence. The map also shows that the footprint of the boxing club was still open space in 1852. It is interesting to note that today’s narrow footpath running along the north of the church, was once the medieval thoroughfare of Church Lane. While Arran and Toby have been busy in the trench with their respective teams, Gary has been working under the ‘Finds Tree’ on processing and cataloguing our finds. It is often in post-excavation that new insights can be gained into what has been going on on-site. 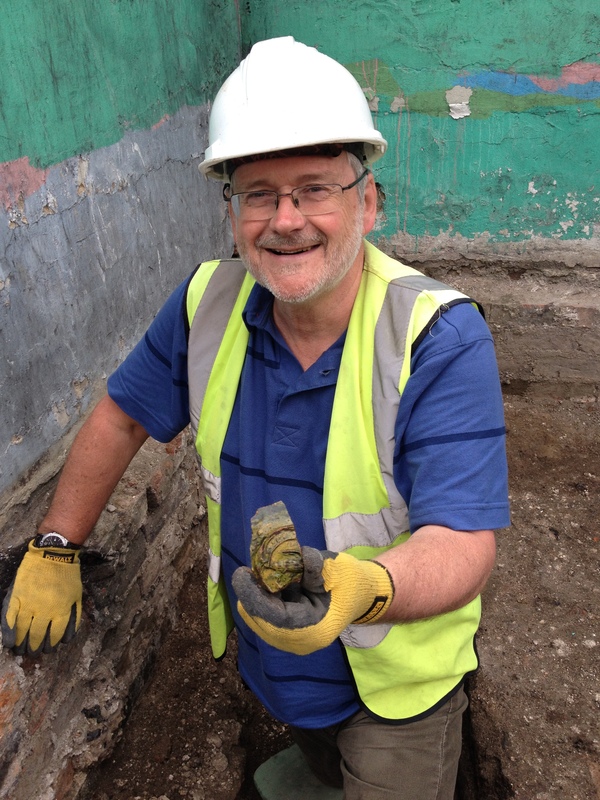 Here, Gary summarises the patterns and trends he has identified in this week’s finds. The finds team dating pottery from contexts they have excavated. The first two weeks of Archaeology Live! 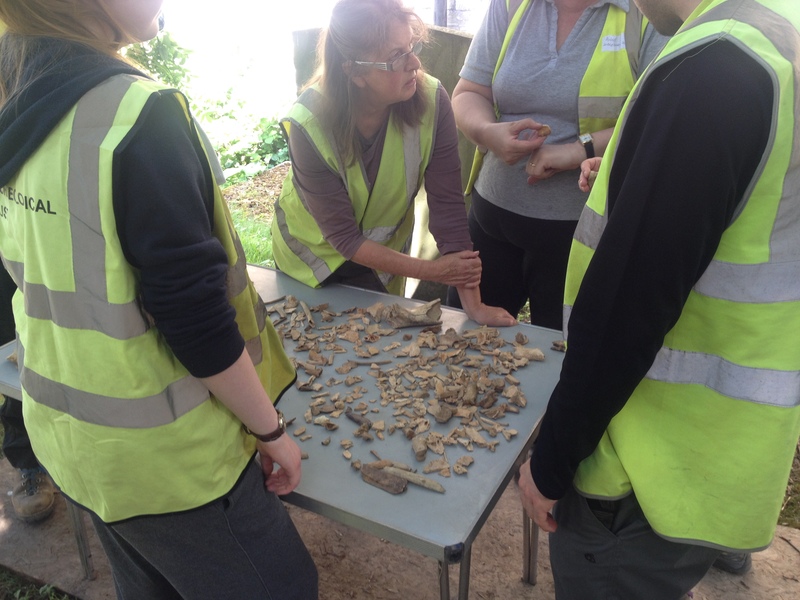 2014 have had us busy processing the finds from the ongoing excavation. 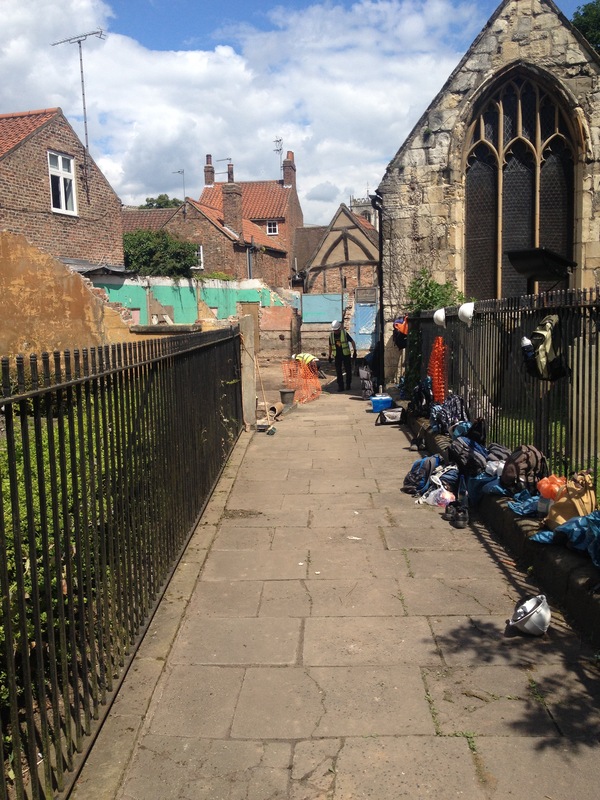 As per usual for a site in York there has been a high quantity of material culture recovered. The features investigated on site so far mostly relate to the construction of the mortuary chapel in the 19th century with some earlier deposits starting to be investigated. Activity in the finds tree has involved washing the material and bagging the dry clean material by type. Washing and bagging the finds is starting to give us an insight in to what we may find at earlier levels due to the amount of upcast residual material found. 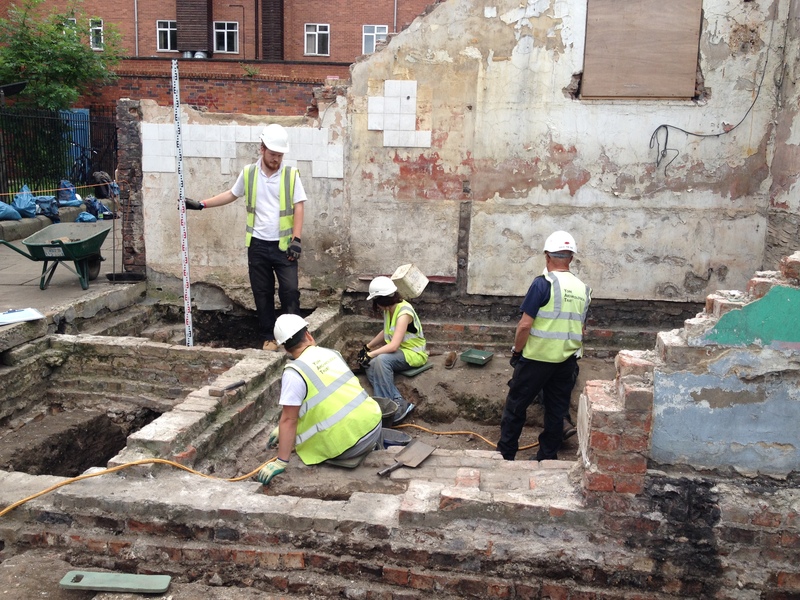 Gary’s finds team taking a closer look at the animal bone recovered from a 19th century context. The majority of the ceramic appears to be 19th century and post-medieval in date (so probably contemporary with the features been excavated). Interestingly we appear to have about as much residual Norman gritty ware (11th-12th C.) as we do medieval green glazed wares collectively. Whether this is going to be representative of changing levels of activity over time on site remains to be seen. In addition to the medieval wares we have already found a small number of 9th-10th century Anglo-Scandinavian pot fragments and Roman wares. In addition to the ceramics high quantities of ceramic building material in the form of bricks, roof tiles, salt glazed drain pipe and occasional floor tiles have been recovered. Some of this material may relate to structures that were demolished when the mortuary chapel was constructed in 1860. 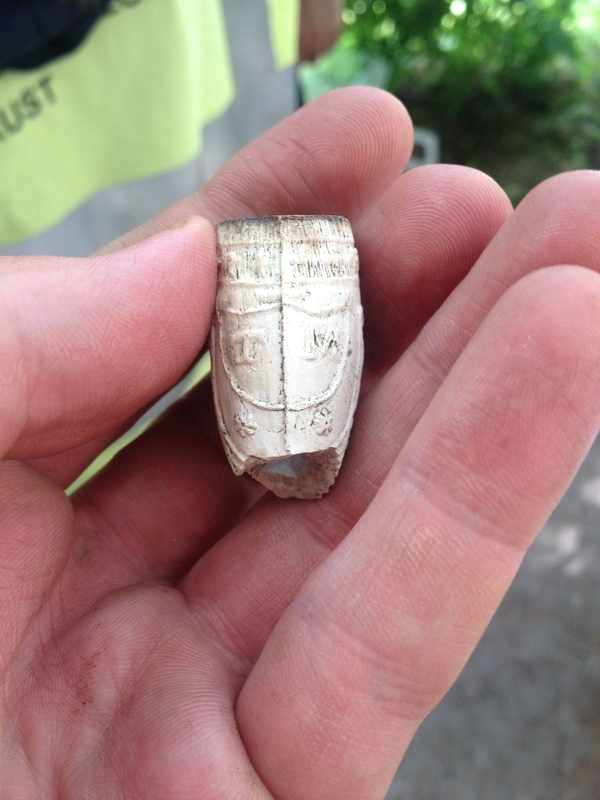 The fired clay tobacco pipe recovered so far also appears to be contemporary with the construction of the mortuary chapel with the occasional earlier bowl (probably c18th – c19th) starting to turn up. Several decorated bowls and the occasional glazed pipe stem have been recovered so the dating of those particular objects can probably be refined at a later date. A cleaned up clay tobacco pipe bowl. The initials ‘TM’ are clearly visible. Animal bone has also been recovered in high quantities. Most of this material appears to relate to consumption. The high percentage of bone horn core we have recovered possibly indicates primary butchery waste although it could also indicate horn working taking place in the vicinity. It is impossible to actually determine specific activities at this point, however, as a lot of the animal bone has been redeposited from earlier features. 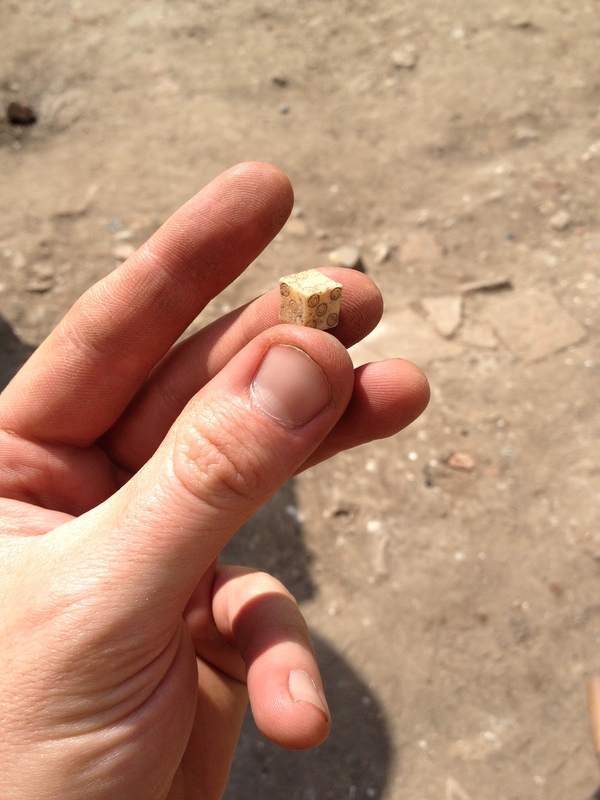 These residual finds are exciting indicators of what we should continue to discover as Archaeology Live! progresses over the next ten weeks. For those of you planning to attend we look forward to seeing you and many thanks to those who have already done their time in the finds tree. Team That End hard at work. Arran’s area has also seen a number of exciting developments this week. 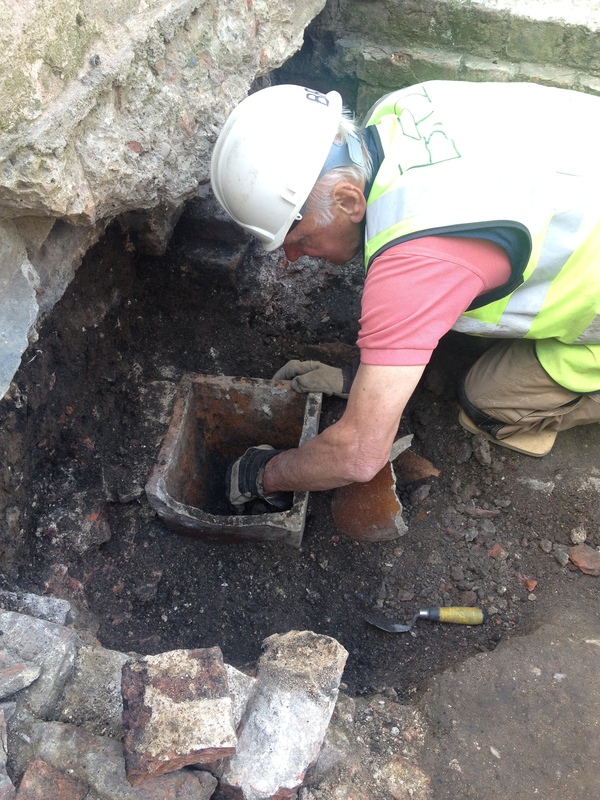 As this area doesn’t have the same level of truncation from 19th century drains as ‘This End’, the team have been able to move more quickly onto deposits that pre-date the 1860s boxing club. 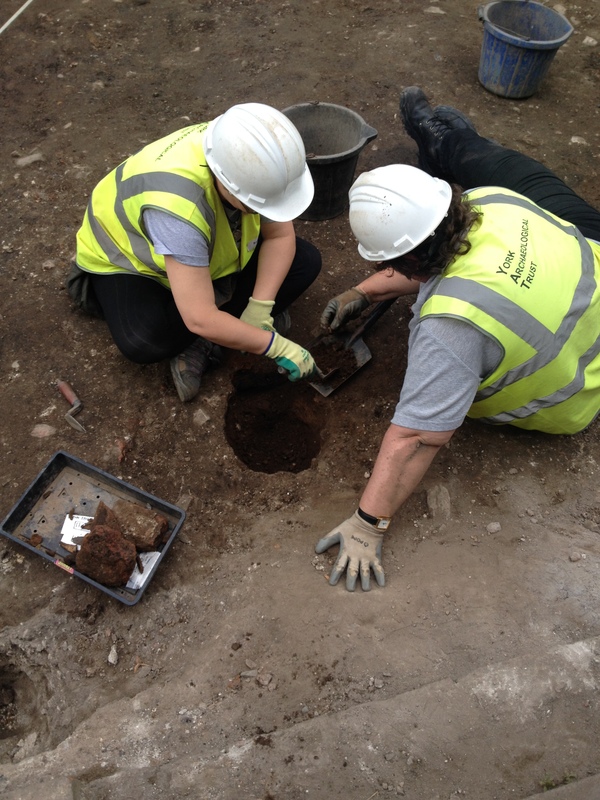 In the north-east corner of the trench, Jade and Rob continued to investigate a sequence of pits and trample layers that once formed part of the yard that pre-dates the boxing club. While still dating to the early 19th century, these contexts are beginning to produce an increasing amount of 18th century ceramics as we work towards earlier archaeology. The trample layers were particularly compacted at this point, prompting Jade to have her first experience of mattocking. From the smile on her face, I doubt it will be her last! Rob and Jade’s area, produced some great finds late in the week. 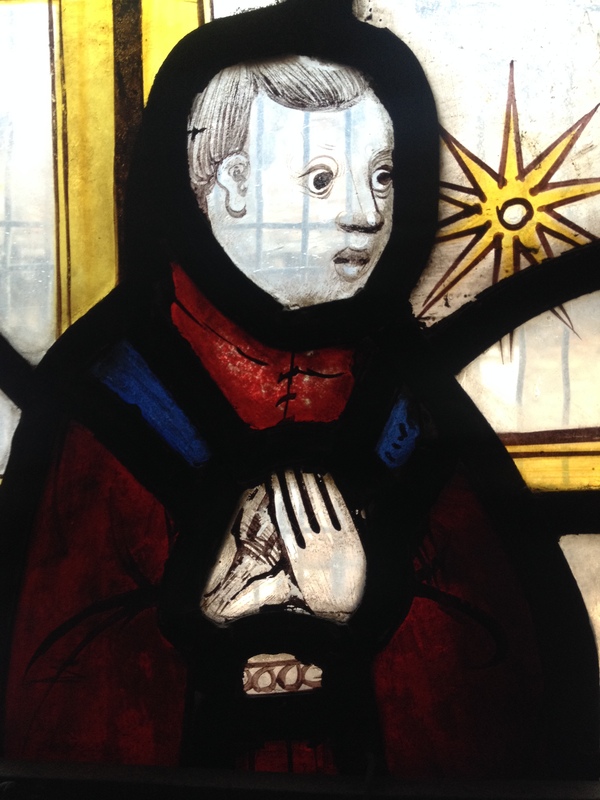 Highlights included a lead hook, a medieval ceramic pan handle and a fragment of masonry carved with a cross. This well weathered stonework may have once been part of the church, removed during one of the building’s numerous alterations. 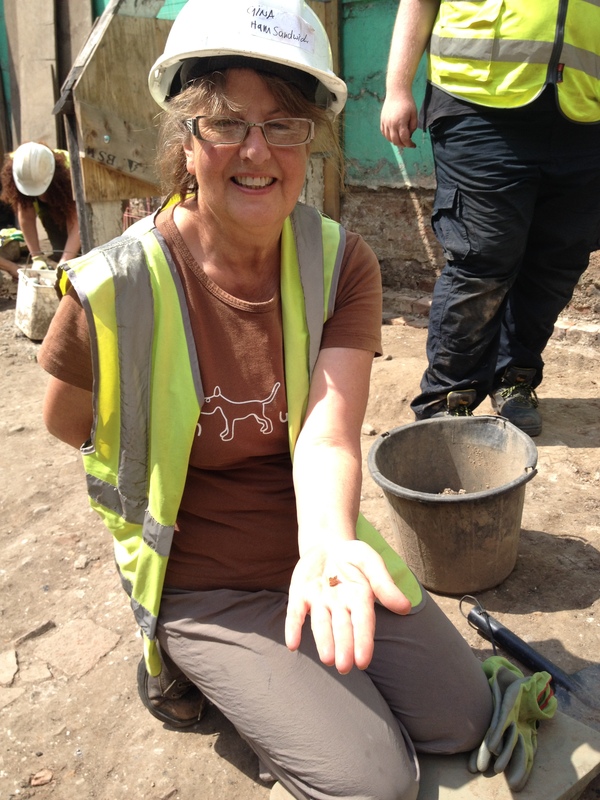 Jade displaying a fragment of church masonry. Gina and Geoff continued to work on another area of early 19th century yard surface. 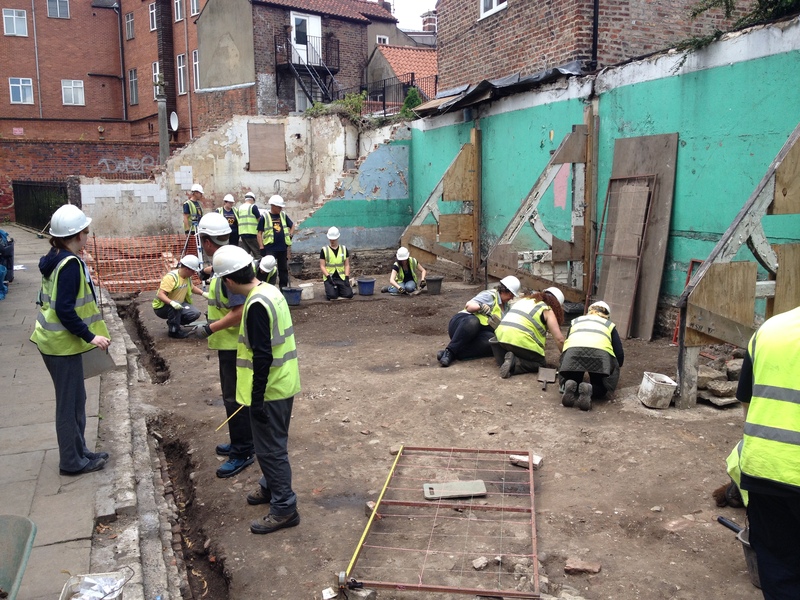 An increasing amount of possible structural elements have begun to emerge, adding evidence to the theory that the standing medieval buildings at the north end of the trench once stretched further to the south. 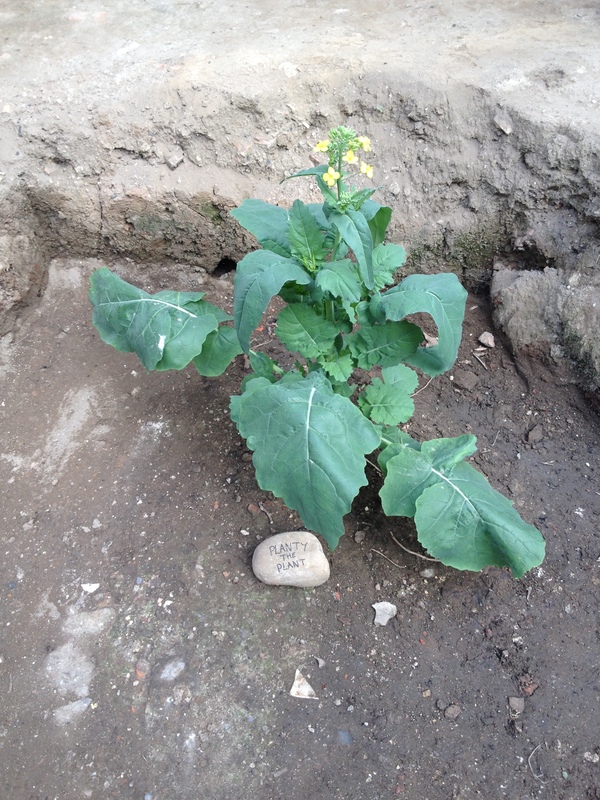 These include a number of possible wall footings, post-pads and fragments of cobbled surface. 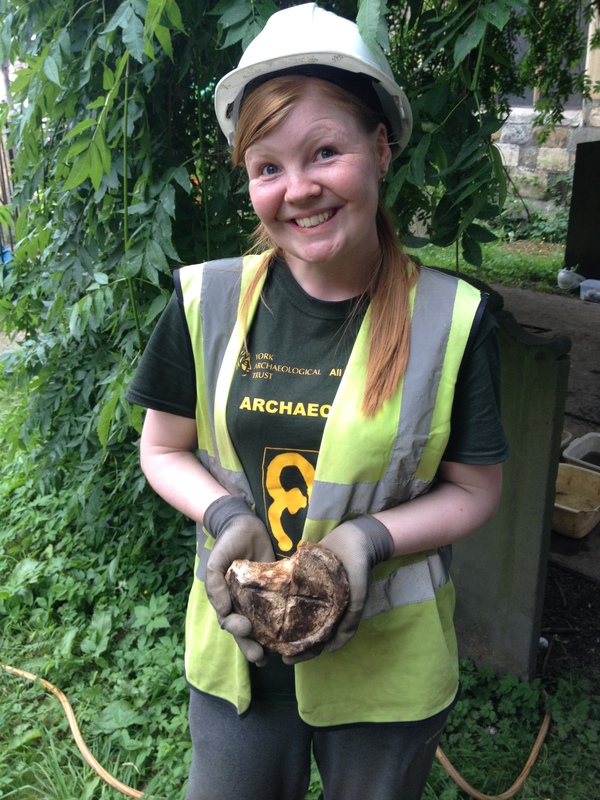 Gina had a great start to the week as she found a rather wonderful bone dice. Gina and her newly discovered bone dice. The dice is most likely medieval in date and is in excellent condition, with the opposing sides adding up to seven – it could still be used today! Geoff joked that he was going to find us a chess piece to continue the gaming theme and he didn’t disappoint! Later in the week, he was delighted to unearth a worked bone gaming piece. Gina and Geoff were joined on Friday by Dylan, a taster student from New Zealand. 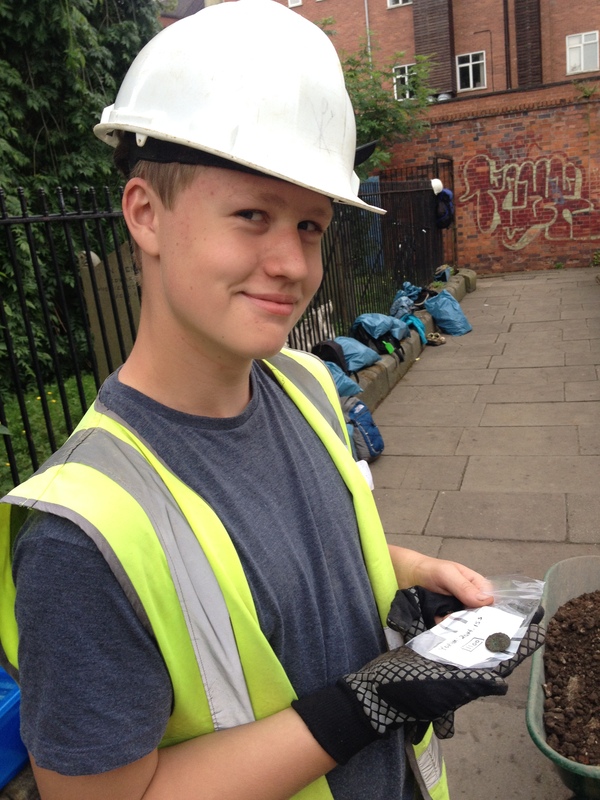 Working on a 19th century yard deposit, Geoff and Dylan both found well preserved sherds of Roman pottery. Dylan’s example was the base of a colour coat drinking vessel. 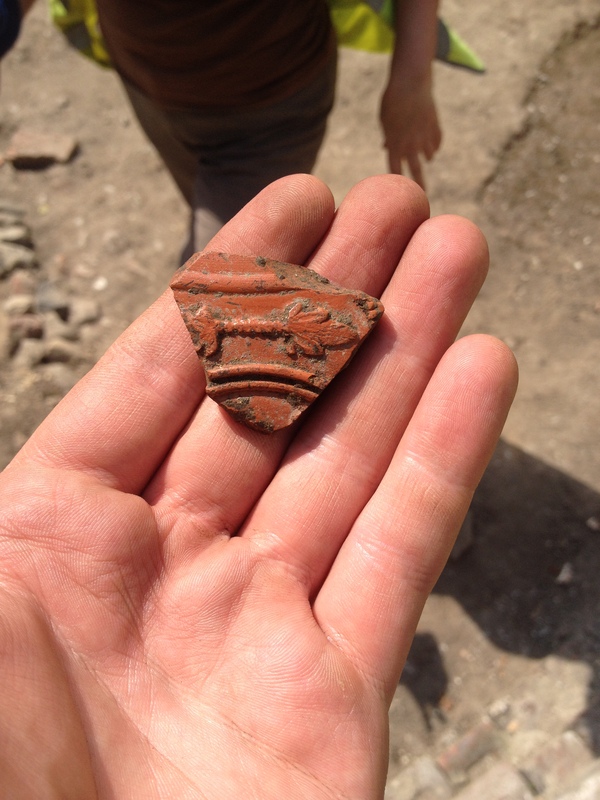 Geoff’s find was a piece of decorated samian ware. Dylan and his Roman pot base. A sherd of decorated samian ware. The next few weeks could prove increasingly exciting as we continue to examine this interesting and fruitful area of the site. Elsewhere in ‘That End’ Anne and Branka recorded and removed levels of construction residue relating to the boxing club. 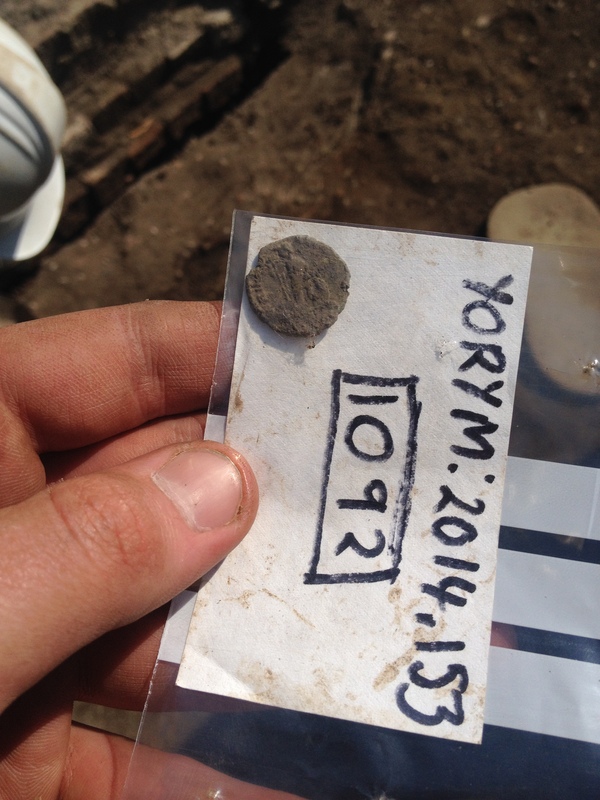 An exciting find from this deposit was a Roman coin, upcast from earlier deposits. The pair then began to investigate a series of earlier features, beginning with a post hole complete with surviving packing stones. While uncertain in date, this feature contained 16th century pottery making it post-medieval at the earliest. The post hole was found to cut in to a small refuse pit, which Anne and Branka began to excavate on Friday. 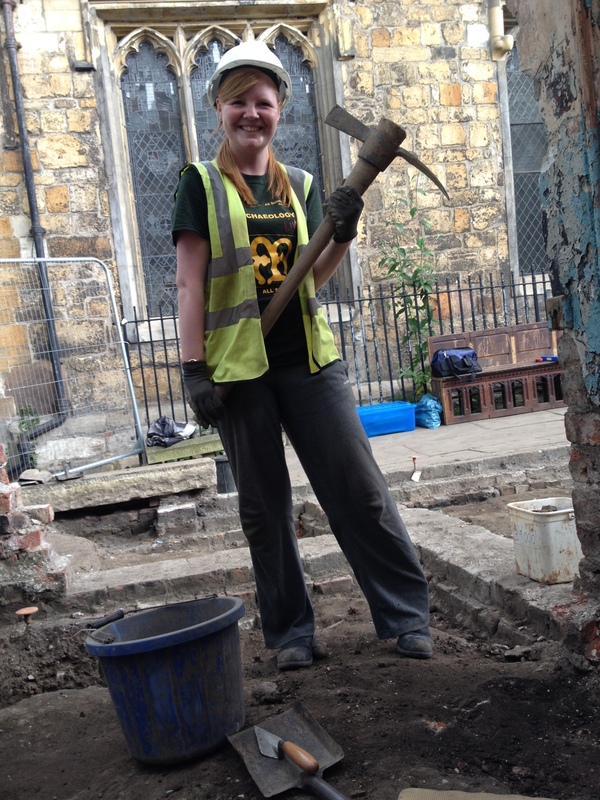 While the dig remains in its early stages, it is encouraging to be getting our teeth into the stratigraphic sequence! Anne and Branka excavating their post hole. 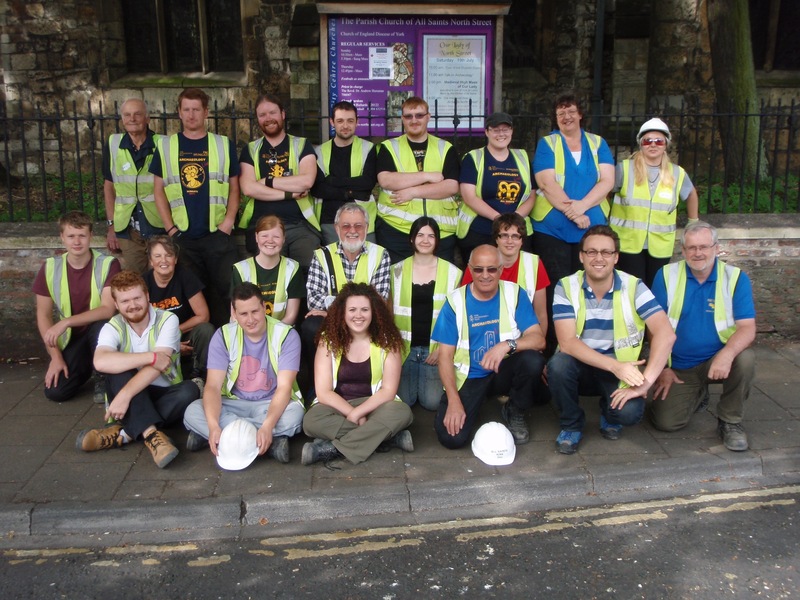 The week 2 team did some fantastic work, dealing with awkward, cramped spaces and complex stratigraphy while still producing some excellent records and finds! Perhaps the best thing to see is that our understanding of the site’s development is really coming along, with tantalising glimpses of early structures appearing in both ends of the trench. 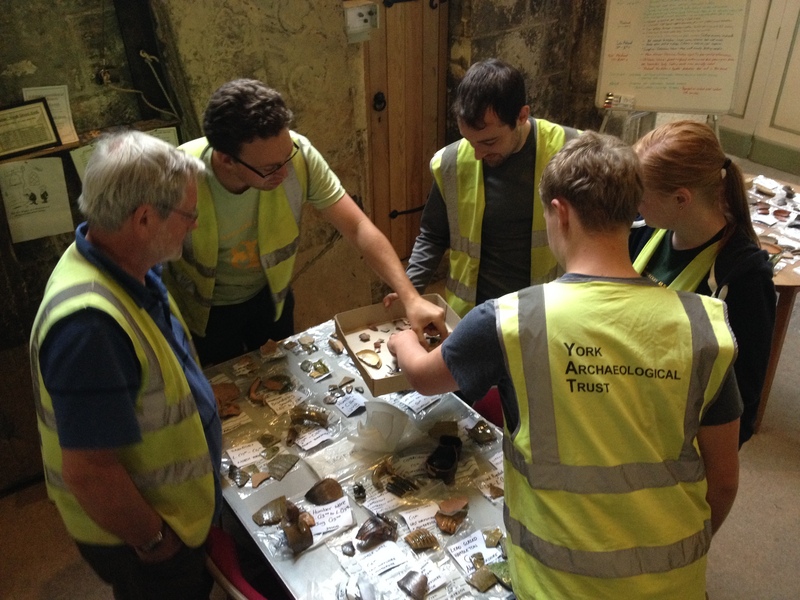 Added to the new insights from under the finds tree, the 2014 season has got off to a great start. Thank you to all our week 2 team! Great work by all. Thanks must also go out to our team of placements who worked very hard to remove the first load of our spoilheap off site. A skip-full in a couple of hours is no mean feat! Dave. Craig and Gus of the placement team working on spoil removal. Here’s hoping week 3 maintains the excitement of the first fortnight, onwards and downwards! Planty the Plant in full bloom.